This 4 day trek starts in the green valley of Ouirgane and takes in the peaks of the surrounding mountains as you trek up to the high passes before reaching the summit trail for Toubkal. It is challenging in parts and also helps you acclimatize before the last push for the highest North African Peak at 4167 meters; that’s 13,671 in feet. All that challenging trekking, affords you outstanding views across the High Atlas mountains, valleys and remote villages. 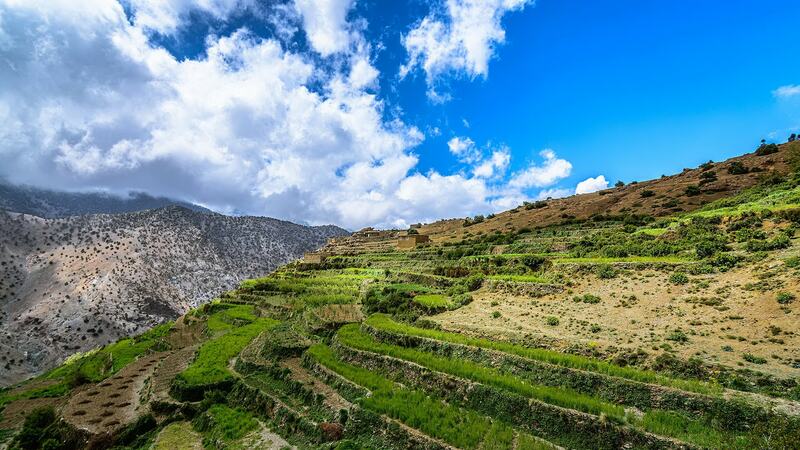 The trek ends in Imlil where you can opt to spend the night or we will organise your transfer back to Marrakech. Today, fueled and rested, we trek up along the river valley through Ait Aissa and Tizi Oussem villages. We may have our lunch by the river, then after a rest we trek up the valley to the Refuge Tamsoult 2400m. This is a magnificent area, terraced fields dominate the view and the high peaks provide a prominent backdrop. Be prepared for a tougher day today as we climb out of the valley from the refuge, to the Aguelzim Pass at 3650m, the panoramic vistas will reward your efforts. Lunch will be taken with spectacular views over the Atlas mountain range. Up early for the climb up Toubkal (4,167 m) from where, clouds allowing, you will have wonderful views over the Atlas range and the Sahara desert. Then a long way back down past the refuge and the well-worn path back to Imlil. This is a fairly long day with 8-9 hours of trekking, involving 900m up then almost 2,500 m back down to Imlil.